Press Release: Los Angeles, CA (March 29, 2016) – Twentieth Century FOX Consumer Products announced today an out-of-this-world global celebration of the ALIEN franchise culminating with a special 24 hour, fan-focused social media event on April 26th – a nod to LV-426, the planet from the iconic ALIEN films. 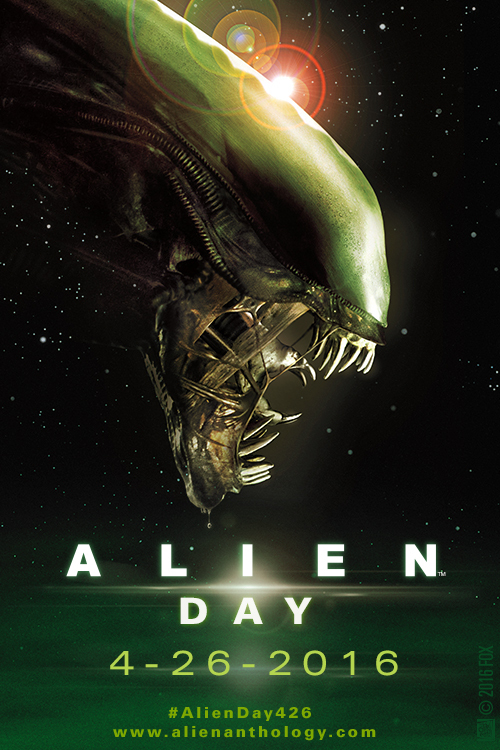 ALIEN DAY (#AlienDay426) will encompass a wide range of executions including nationwide screenings, never-before-seen consumer product activations and the kickoff of the ALIEN: Ultimate Trivia Challenge, allowing fans to test their ALIEN knowledge – with the chance to win memorable prizes every 42.6 minutes on Twitter. In addition, the Alamo Drafthouse is producing a nationwide screening program on April 26th returning the ALIEN franchise to theaters across the country. In over 20 cities, including Austin, New York, Los Angeles and Dallas, participating Alamo locations as well as partner venues will showcase a double-feature presentation of ALIEN and ALIENS. In Alamo locations, each pre-ordered ticket includes a Mondo-designed ALIEN T-shirt, released exclusively for the event screenings. Additionally, the screenings will be accompanied by exclusive ALIEN merchandise-including apparel, accessories, posters and records-from pop-culture company Mondo. Tickets go on sale tomorrow, to find a full list of participating theaters, visit http://AlamoAliens.com. – ALIEN DIGITAL PINBALL– Fox Digital Entertainment, in partnership with Zen Studios, will launch three digital pinball tables via iTunes, Google Play, PlayStation Network, XBOX Live and Steam. – KOTOBUKIYA– The Japanese manufacturer unleashes an assortment of highly detailed collectables this spring including a 1:10 scale Warrior Drone ARTFX+ statue from ALIENS and mini “Big Chap” figurines posed to strike up conversation around your home or office! – LOOT CRATE – The monthly mystery subscription box for pop culture fans will launch a limited-edition ALIENS 30th Anniversary crate on 4/26 filled with exclusive merchandise, collectibles and more from all core licensee partners.